Help your Clients Succeed Online. All the tools you need to manage digital marketing successfully. 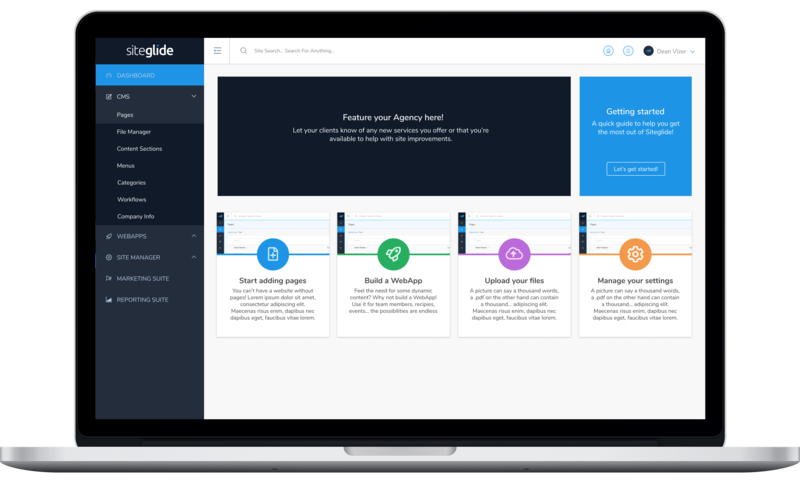 Whether you already run digital campaigns and websites for clients or want to expand your offering, Siteglide can help you dramatically increase profitability and reduce headaches. We take the technical challenges away from web management. We have 3 very different ways in which you can work with us depending on your requirements and expertise. Either simply Refer clients to us, Collaborate with a Development Partner or become a Development Partner and handle the whole project with our support. All 3 options provide excellent opportunities to grow your agency/ business thanks to our reliable and efficient process. We work with you to help enhance what you do best and provide the necessary support with all things technical. You can contact us any time using our built-in Support Centre. Check this box to sign up for our partner newsletter. Fill in the form to the left to register your interest in becoming a partner. We're currently evaluating partners and will be bringing more partners on-board based on various factors including suitability and synergy. Just get in touch and we'll arrange a demo and discuss the various options.